I love the stereotypes that cross my path (or maybe I cross theirs). I have had a great month taking it easy in old haunts and took this photo in one of my favorite places. The lady in the photograph is feeding the pigeons. I saw her last summer doing the same thing, this year I asked if I could take her photo. She told me of how hungry they are, its because the council keeps everywhere too clean theres no crumbs for them. 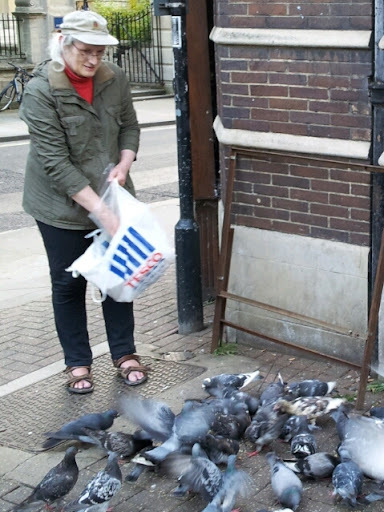 I love that she feeds the pigeons. Funny things birds, I know very little about them. in the past I have grown tired of people/greenies that I meet going on about them. I think the assumption that I care about the environment any more than a regular joe irritates me, we all make assumptions though -we can't help it. having said that there have been times when birds have sunk deep into my mind. Before the real onset of my spoon obsession I got caught in a moment using a beautifully worn turned wooden spoon to pluck eggs out of the pan they were hard boiling in. The simple task of fishing out one egg at a time with this perfect humble spoon overwhelmed me with completed focussed joy, I was consumed in the moment, I was so content. Chicken or egg? My love of eggs came well before my love of chickens, but over the last 12 months I have become a big fan of those beautiful egg making machines. At a friends woodland where they are well set up I had the job of taking the scraps down to the chickens on a loverly summers evening, again I was lost in a moment, a simple task a sense of satisfaction. Having the space in my mind to experience these simple things, without using rational thought, has been a lifelong need, the more space I have for these experiences the happier I am. I am in london now and it was here that I saw a group of six or so children around the age of five chasing pigeons. I was carving spoons by marble arch, and this motley crew of boys and girls had self assembled in an anarchic co-ordinated hunting party, as if instinct prevailed the children running like driven maniacs attempted to divide and conquer the flocking birds at once huddled together and then airborne again. A strange energy surged through the children the look on their faces as they hurtled towards the pigeons is etched on my mind. Birds have obvious symbolism in our cultures, for a while I was obsessed.with the image of a bird in a cage. There is a fantastic bit in the film The Prestige where the illusion of the bird in the cage vanishing is revealed for what it really is. whilst hitching the other day I saw a pigeon wing beautifully displayed on a busy A road stretched out on the hot tarmac the rest of its body nowhere to be seen.